A Crawley man found with nearly £13,500 worth of drugs in his home has been given a prison sentence. Police say they conducted a warrant at the address of Matthew Stevens in Dobson Road, Crawley, after reports from members of the public regarding suspicious behaviour in the area was reported. During the search on July 15 2016, officers found a quantity of cocaine, spice and drug paraphernalia. Stevens, 44, was then arrested. 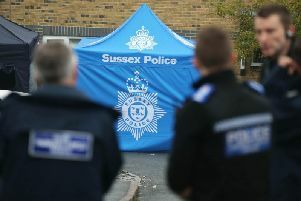 He was released under investigation and police say that the Crawley Investigation team began a long and complex analysis of items seized from the address. He stood trial at Hove Crown Court and on Friday November 2 Stevens was found guilty by a jury and sentenced to a total of four years. “The presiding judge recognised the severity of Stevens’ actions and imposed a sentence representing that. “We are conscientiously robustly tackling drug issues in Crawley and urge anyone who notices any suspicious behaviour to report it to us without delay.